I was a big fan of Ottolenghi even before I stepped into one of their restaurants. When I got a copy of Yotam Ottolenghi’s first book, I was blown away by the photographs of gorgeous dishes, heaped with generous amounts of fresh chopped herbs, irregularly cut vegetables often seared and caramelized, and roasted, juicy meats accented with citrus or unexpected spices, usually with a Middle Eastern bent. 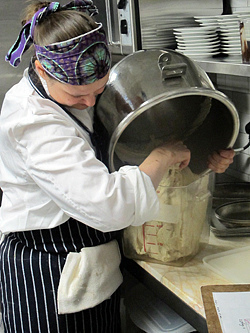 The bold, big flavors came bounding through the pages and appealed to me as both a diner and a cook. But how happy was I when I found out the publisher was hosting a breakfast at his restaurant, Nopi? And in spite of all he probably heard about me, he graciously showed up to say hi. I knew I would love the restaurant even before I got there. And sure enough, coming in the door and being welcomed with a pile of giant loaves of pain au levain, with a basket of croissants and pains au chocolat waiting patiently alongside for the early morning rendez-vous. 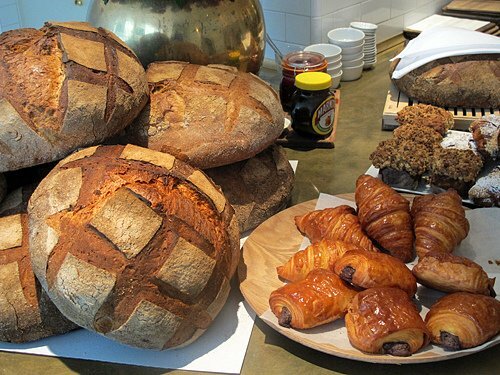 The bread is made in one of the other Ottolenghi shops, but the morning pastries are made in the downstairs kitchen, which overlook two communal tables and a display of all the wonderful products the kitchen uses. Shatteringly crisp croissants that explode into a gazillion buttery little bits when you rip into them, grain-filled carrot and apple muffins under a lid of nutty streusel, and slabs of griddled focaccia bread, ready to be smeared with British golden butter, everything was the best example of its genre. After I polished off a double espresso, a cappuccino, and a fantastic juice blend of carrot, ginger and apple, for breakfast (which has me seriously questioning the wasted years that I drank plain ol’ orange juice when I could have had this), I had Shakshuka, a heavy copper skillet brought to the table filled with a spicy tomato sauce and smoked cheese with two eggs gently poached in the stew. It was so good, I strongly considered skipping lunch, just to keep the taste of it in my mouth for as long as possible. A woman dining alongside me dug into an enormous plate of scrambled farm eggs and Forman’s smoked salmon, along with a heap of fresh herbs. 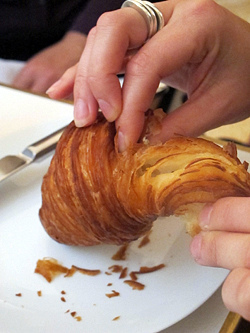 If I wasn’t embarrassed by my inability to try to eat every morning pastry on the table (although I did give it my best shot), I would’ve stuck my fork in. But since there were members of the press in attendance, I remembered that I needed to be on my best behavior. Rats. San Francisco Events Next Week! I would love to visit one of his restaurants! Those eggs poached in stew look amazing. His latest book is definitely on my wish-list. I couldn’t help but notice the jar of Marmite in the top picture. Good to see that this humble, beloved British ingredient is still popular in such fine places. I see marmite gracing the table as well! I’m travelling to London this coming Xmas and was just starting to think about writing a list of places I wanted to eat at. Thanks for the review, can’t wait to have breakfast here and try the carrot, apple, and ginger juice. 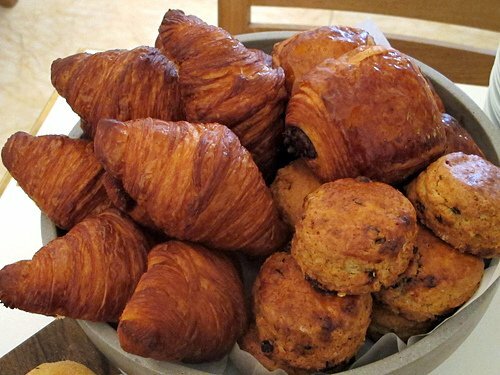 Those croissants look like absolute perfection! I can almost hear them just from looking at that picture of some lucky diner tearing into them. Jealous! I love Ottolenghi’s books and enjoyed lunch at his restaurant in Islington (though the long wait made me crabby!) 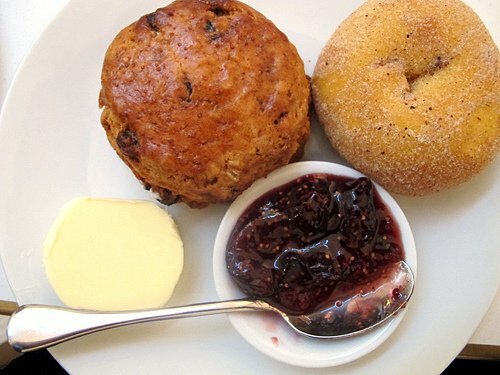 This breakfast restaurant looks just the ticket! Breakfast is my favourite meal and I think I would like everything that’s on offer! By the way the tweed jacket…..it needs to be at least 4 generations old and smell of cat pee…..glad you’re enjoying Blighty! I ate at Nopi a couple of months ago and it was amazing! Every dish that we ordered was sublime, and I’m not even exaggerating! We just about ordered one of everything on the menu, but I think the best was dessert (obviously) – the fresh doughnuts with plum wine anglaise and berry compote. I think I actually blacked out while eating them they were so amazing. 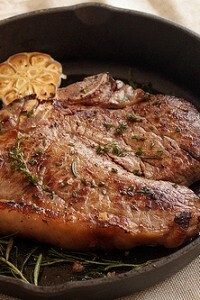 “generous amounts of fresh chopped herbs, irregularly cut vegetables often seared and caramelized, and roasted, juicy meats accented with citrus or unexpected spices”…. UM, YES, PLEASE! I am absolutely sold on Yotam. 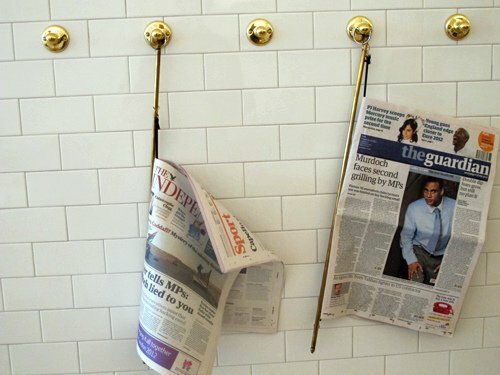 The last picture–are those newspapers hanging next to urinals? Does it really take that long to pee? Gretchen: Those are hanging in the dining room, which has white tile walls. But I did have to double-check when I saw the comment since I didn’t want to post the ‘wrong’ picture here..
tracy: That’s a great review! I didn’t pass out but felt like it. Wish I lived closer. angela: Nopi wasn’t all that crowded, perhaps because it was the morning. I think that may be the time to go for maximum calm. la domestique: It was really, really good. I found the recipe online and posted a link at the end if you feel like trying it yourself. I may give it a go, but perhaps for dinner. Yummmmy. He did a dinner at Camino that I meant to go to but it sold out too fast. After reading your report I am doubly sad I missed it. That Shakshuka looks amazinggg. And those croissants? I can’t even believe all the flaky, buttery layers going on there! I am dying to go to Nopi, and Yotam is just wonderful. If you haven’t seen it, you should try to get hold of the episode of Masterchef he took part in, where they gave contestants a vegetarian-cooking challenge. 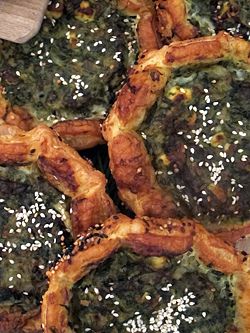 What are the spinach-y-looking pastries? I LOVE this guy. i borrowed Plenty from a friend and really shoudl just get it myself because i’ve had it for months now…. This looks extremely delicious. Nopi seems like a great place I think I should go next time I will be in London – a city plenty of nice places to go to, but as I am not living there permanently, my stay is always much too short to discover in detail where to go to. Now I already have put something on my list.. And thanks for the recipe links, interesting to discover more details. I was so annoyed not to get to your book signing the other night. Nopi is wonderful for lunch- you must go back the next time you are in London? Did you get to the Ottolenghi cafe as well? Emily: It’s a pastry with a Swiss chard filling. I didn’t try it because I was working my way through quite a few other things. There’s an interesting Swiss Chard Tart recipe here on the site, which is Niçoise, and is an interesting dessert. a fortnight ago we had a family reunion dinner there, it had been almost 2 years since I had seen my sister and her husband who live in London, myself and my parents live in Sydney. 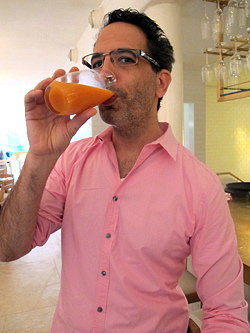 The food was beautiful … but David, after all of that juice and coffee did you use the bathroom? ? ? omg I love Ottolenghi and all of his books! My clients actually have a house in London right around the corner from one of his places… dying to go! The last time I was in London, I had lunch in Nopi – my first Ottolenghi experience. The sourdough bread and Shakshuka were fabulous, but I couldn’t help feeling the restaurant was all a bit too precious – or maybe just too central London. It is the polar opposite of the little restaurant “in an tiny alley in old Jaffa” described by Yotam in Plenty (page 87). Buy the book, it’s more of a treat and you can conjure up the experience of eating outdoors at shabby (chic) tables yourself! David, I am from Scotland and I have your Ready of Dessert Book, which I adore. I bought it in Vancouver – maybe the Brit’s are not quite ready for you yet! Although I am happy to have you to myself…ahhhh. I am so glad that you got to meet him and go to the restaurant, sounds fantastic. I have both books and they’re superb. Must come to London soon just so I can go there as well! I just love the Ottolenghi restaurant in Angel area. Breakfast / brunch are amazing. You’d want to eat it all. Nice pictures, makes one want to go there. Rien a voir mais j’ai adore The Sweet life in Paris. I’m a big fan of yours since then. 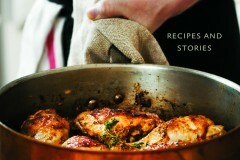 Yotam Ottolenghi is a genius as far as I’m concerned! Did you see his meringues….beautiful things! His column in The GuardiN is the only reason I read that newspaper online. I’ve never been to Nopi…will have to add it to my list of “have to go to places” for my next tripmto the UK! Thanks, David! Please, what is the plump doughnut-esque pastry above the jam in the upper left photo in the last photo quad? Thank you for this post- I am reading it just before breakfast. I’ll be in London late October. Cannot wait to try this place out! Looks delicious! 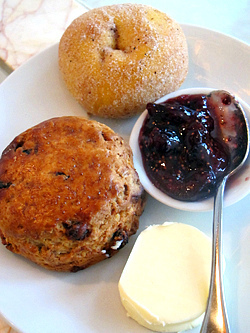 When I used to live in London, I would breakfast at Ottolenghi after dropping my daughter off at school, then wander about the shops in Notting Hill and drop into Ottolenghi again for a light veggie lunch. I miss those days very very very much… wish there was an Ottolenghi here in wonderful Pareeeeeee!! Tina: That’s a doughnut flavored with anise seed. It was very light, but really aromatic. Eva: I had a chat with Yotam and said that he should open in Paris. I think his cafés or a restaurant would get a great reception (although Parisians don’t go out for breakfast, so they’d be lunch or dinner spots)..but there’s such a need here in Paris for places serving fresh, well-sourced, delicious food like this – the few places that do are always packed. It’d be nice to have more! Thanks David for the shakshuka video link – I am salivating like crazy. 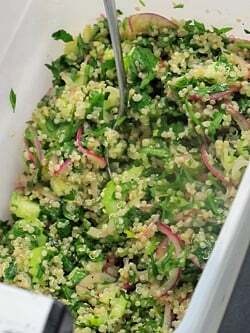 What is the quinoa? salad you showed 2 times? David, it was really wonderful to meet you at La Fromagerie. And your book is so inspiring. I have to make that chocolate cake – it was the winner, if you ask me. Although the crumble made me close my eyes, too… Yum! Oh, poor Murdoch, facing his second grilling – – just when so many tasty treats abound, too. I’m heading out to London in November and now I will make a stop at Nopi. David, Room For Dessert is fantastic! Thank you for everything. I’ve been an Ottolenghi tragic since I saw his first book, too, and am desperately keen to get to one of his restaurants. The books keep me mildly happy, as does his regular piece in the Guardian (online) and I actually have some pumpkin cooling in the kitchen ready to be made into the recipe he put on The Guardian website yesterday! You are one lucky sod, David! David, what a beautiful and generous piece! Thank you and please come back to London soon so we can catch up again and I can show you some of my favourite places around. And thanks to all the rest for the warm comments! 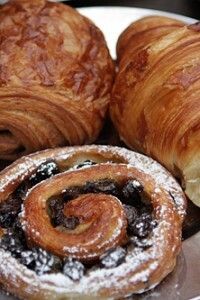 Wow, I’ll add that place to my London list – what better than to balance a naughty pain au chocolat with a healthy juice!? Looks divine! Shakshuka eh? Well by the picture it looks amazing, and I would eat that any day of the week. Those swiss chard tarts also look very good, I love swiss chard. I hope you went back there when the press left and tried it all, hahaha. Thanks for the mention David – I am in France at the moment so was sorry not to be able to make it along to brunch at Nopi as I think it is just a brilliant restaurant. I have Ready for Dessert as well and am really enjoying it so far. wow…my favorite!! 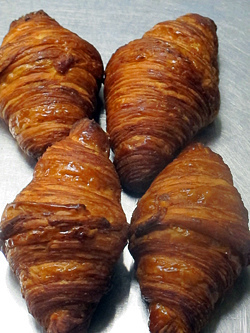 croissant….your pictures look great and love them. I love Nopi (going back for dinner tonight) but only had my first brunch there this weekend. Like you, I loved the shakshuka, and the black rice with coconut milk and mango was gorgeous too. The presentation of the food is so beautiful, just as at Ottolenghi – it’s such a pleasure to see it spread out before you. PS. Have you been to Au Passage in Paris yet – the tomatoey sauce in the shakshuka reminded me of the most superb piperade I had there a couple of weeks ago. Terrific place, excellent cooking – a new favourite for me. We had dinner at Nopi two weeks ago, it was a such a pleasure – wonderful, interesting food and a lot of fun :) my favourite was the braised pork cheeks with sweet corn puree and smoked corn … Thanks for a lovely post ! David, so glad to hear abut your meeting with Yotam ! I have your blog open in one tab and Ottolenghi’s on the next tab – at all times – need I say more? 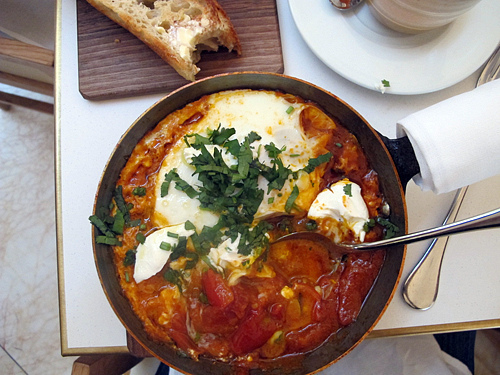 A video of Yotam cooking shakshuka was featured recently in the Guardian U.K. I made it at home, and it was delicious!!!! Nice review and pics. We like Otto’ a lot as everyone else does. I’ve posted quite a few of his recipes, but my tip is try the brunch hummus if you really want something mind-blowingly different when you don’t expect it..!